St. Louis, January 18, 2018—Eight months after piloting YourSTLCourts.com with unincorporated St. Louis County, local nonprofits Rise Community Development and CivTech St. Louis have partnered with REJIS (Regional Justice Information Service) to expand easy access to personal traffic ticket information via this free, digital tool. With this new partnership, YourSTLCourts can service 30 municipalities within St. Louis County and St. Louis City, representing nearly 75 percent of residents. It also brings together more independent municipal court databases than anywhere else in the country. “We are glad to see more-and-more municipal courts in St. Louis County working with YourSTLCourts to get more information to those who are involved with their municipal court,” said Hon. Douglas R. Beach, St. Louis County 21st Circuit Presiding Judge. YourSTLCourts puts municipal court records into one, no-cost, mobile-friendly, online portal where people can easily access their ticket information and outstanding warrants, as well as court contacts, information and procedures. The program also includes a text-message notification system to remind people of upcoming court dates. With a better understanding of their rights, municipal court users are empowered to keep minor offenses from escalating unnecessarily. Additionally, municipal courts are given tools to improve transparency and accessibility. “REJIS is proud to partner with homegrown startup CivTech St. Louis and the courts we serve to provide a one-stop shop for defendants caught in a tough-to-navigate system,” said former St. Louis City Police Chief and current REJIS General Manager Dan Isom. In 2015, Living Cities awarded Rise, in partnership with St. Louis County, a John D. and Catherine T. MacArthur Foundation grant to create CivTech St. Louis (formerly St. Louis Civic Tech and Data Collaborative) with three goals: improve the experience that low-income people have with the municipal courts, lower the outstanding warrant rate and decrease incarceration as a result of traffic violations. CivTech St. Louis developed YourSTLCourts to serve residents and help courts comply with legislation passed by the Missouri Supreme Court in 2016, which imposed minimum operating standards. In August 2017, CivTech St. Louis became a standalone 501(c)(3) nonprofit organization. 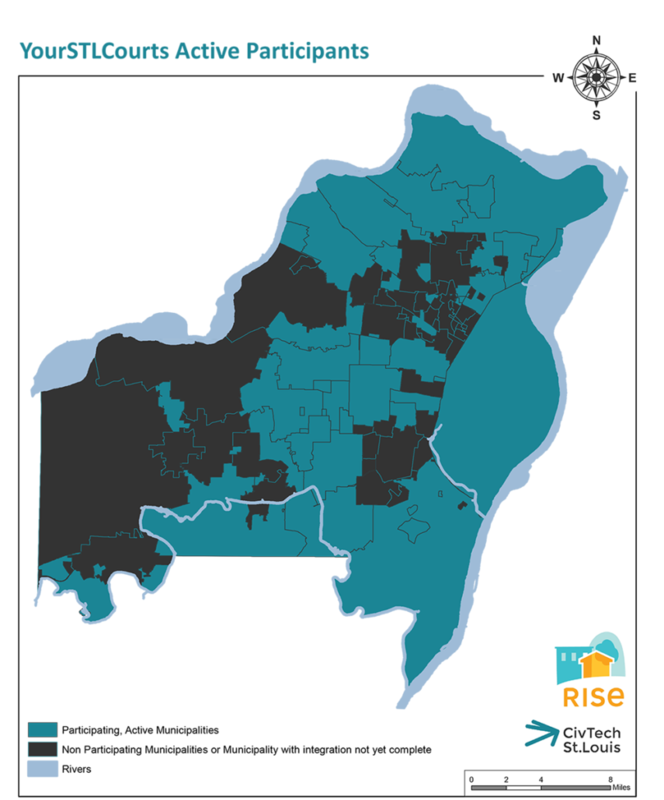 Rise (www.risestl.org) is a nonprofit organization that partners with communities to build stronger, more equitable St. Louis-area neighborhoods. As a community lender, Rise develops affordable and market-rate housing, particularly in neighborhoods with the potential to enhance economic diversity. Rise also provides capacity-building and technical assistance to community-based development organizations. Additionally, the organization maintains a variety of data and mapping for areas throughout the region and assists in the collection and creation of data specific to developments and neighborhoods. YourSTLCourts (www.YourSTLCourts.com) is a product of CivTech St. Louis (formerly St. Louis Civic Tech and Data Collaborative), a nonprofit organization and the local affiliate of the Civic Tech and Data Collaborative. The national collaborative is a joint project of Living Cities, the National Neighborhood Indicators Partnership and Code for America. It is funded by the John D. and Catherine T. MacArthur Foundation.